RT Radiance - another stunning pattern of absolute professionals in their work - the studio RocketTheme. 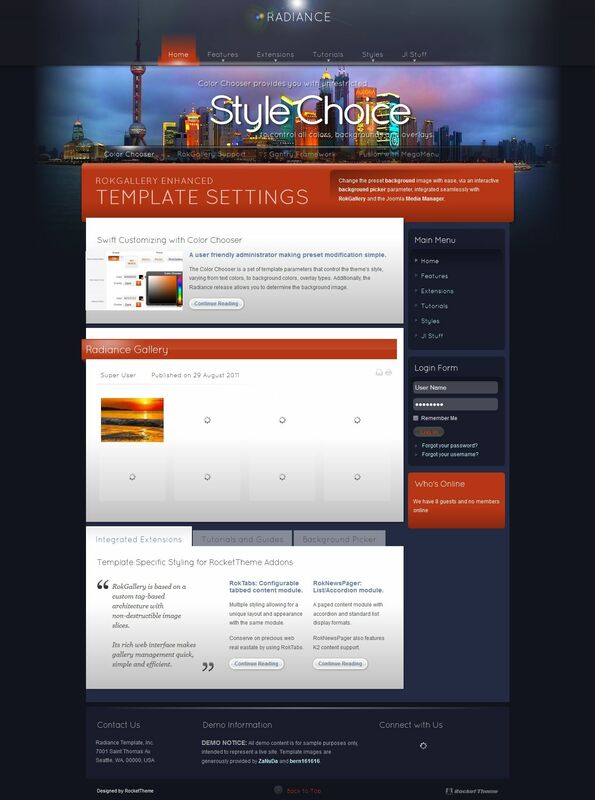 This template comes with built-in tools color selection Color Chooser, which uses the color values ​​in CSS, combined with transparent overlay images, can set the style and color you want and convenient manager Background Picker, allowing load and display wallpapers site component RokGallery or standard media - Galleries CMS Joomla! Pattern works on a modern platform Gantry Framework, includes built-in styles for third-party developer RocketTheme extensions and is fully compatible with mobile devices iPhone and Android. Support for versions of Joomla 1.5 - 2.5.